What is a hyaluronic (gel) injection? Hyaluronic acid in a joint, simply put, is synonymous with oil in a car engine. The hyaluronic acid is a viscous (thick) fluid that is a long chain molecule that keeps our joints lubricated to lower resistance for the cartilaginous surface to prolong their life span. Scientists recently have looked into injecting these hyaluronic injections into joints to help keep them lubricated and also reduce inflammation. The hyaluronic injections have multiple pathways in which they supposedly work. Some of them include decreasing inflammation, helping give cartilage vital nutrients, reduction of swelling by calming the synovial cells and acting to calm nerve fibers that are inflamed. Some of the main benefits include promoting cartilage healing, increasing joint lubrication, decrease inflammation in the joint and decreasing pain. 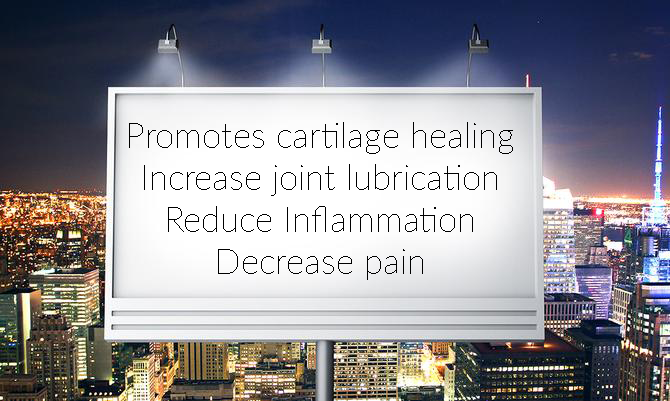 Sign showing how hylauronic gel injections promote cartilage healing, increase joint lubrication, reduce inflammation and decrease pain. Want Hyaluronic (Gel) Injections? Let us know when and we will call you within 24-48 hours to schedule your injections! Yes, Dr. Maurice Jové Yes, Dr. Nathan Jové Yes, Dr. Jeff Traub No, I don't have a physician I am currently with in your practice.